FAQ: How do collapsible tanks hold up in extreme weather conditions? Question regarding collapsible tank performance: How does the collapsible tank material handle the weather? We want to install the tank for a mine in the desert. Can these tanks operate in various hot and cold climates? Answer: Thank you for contacting us! Our Collapsible Pillow Tanks are extremely well equipped for both hot and cold climates. If you are planning on using this tank in a outdoor location that requires compatibility with a specific temperature, please let us know the temperature required and we would be happy to find a fabric option that meets your requirements. The typical temperature ranges you will find for these flexible tanks will include anything from -58° F to 180° F. This includes several cold temperature and hot temperature climates. Several of our customers have used these tanks in extremely hot or extremely cold conditions such as Alaska or Saudi Arabia. These options additionally include several thickness specifications to meet both small and large capacity storage requirements. All tanks are typically equipped with a UV resistant fabric that helps the tank with storage in an outdoor area. 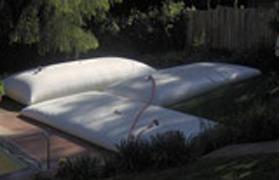 Additional items, such as a ground cloth or berm liner, may also be added to the storage area to help further extend the lifespan of your tank. From here, we can work to provide you with the best fabric and tank option for you specific location. For more information on Collapsible Tank Performance, please view our flexible tank pages.